“The Encore Nancy Zeltsman Graduated Set was devised to provide an affordable means to try a graduated set if you haven’t already done so. This is a combination of mallets I use about 60% of the time. It naturally ‘voices’ most chord playing. In essence, this graduated set is an example of the way my entire line was designed to best flatter different registers of the instrument. 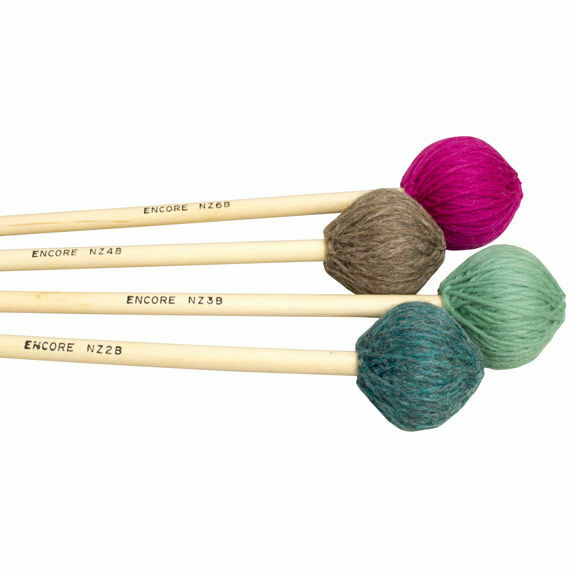 This Graduated Set of 4 Encore Nancy Zeltsman’s mallets includes 1 each of NZ2B Medium Harder, NZ3B Medium Hard, NZ4B Medium and NZ6B Articulate Bass. Birch Handles. These mallets are very well crafted! You'll get a great sound and they'll last forever. These are very good mallets, but the bottom mallet of the graduated set is way too soft. Even in the lowest octave it is difficult to get a good sound with it. I replace it with a different bass mallet. The rest of the mallets are very good though. I like everything about these mallets except this combination - the bottom mallet is way too soft. They're arranged hard (2) - med hard (3) - medium (4) - soft (6), the gap in attack and volume between mallets 1 & 2 is much too large. Not a fan. My pink mallet is in my bag collecting dust, I substitute a Mike Balter 84 for the bass mallet. I love these mallets. They are lush, but they speak well through the whole instrument. The difference in hardnesses through the graduated set make this a great set of mallets for all around practice (for particular pieces) and for performance.